Education Secretary John Swinney has defended the pay offer to college lecturers as they went on strike to demand a cost-of-living increase. Lecturers joined picket lines yesterday after rejecting a 12.2 per cent pay increase from Colleges Scotland, saying the offer does not constitute a cost-of-living rise after a three-year wage freeze. The Educational Institute of Scotland (EIS) Further Education Lecturers’ Association (FELA) has accused “intransigent management” of “using conflated figures in publicity to obfuscate the pay claim”, and is calling for a pay rise above the increasing cost of living. But Mr Swinney told the Education Committee at Holyrood that December’s budget contained funding for colleges to bring lecturers’ pay in line with other public sector increases. Mr Swinney also claimed a cost-of-living increase is being offered by Colleges Scotland. However, Mr Swinney defended the funding for further education in the proposed budget. He said: “Resources clearly are there because the employers have offered that. “The colleges sector finds itself in a position able to harmonise the contracts of further education lecturers across the country, which I’m very pleased the Government has been able to secure as a policy objective and which is now being implemented over a three-year period from funding by the Scottish Government. 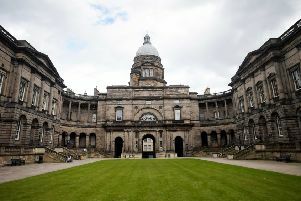 Members of two teaching unions voted by 90 per cent to ten per cent in favour of the strike action in December after rejecting the pay offer Colleges Scotland claims would have raised average salaries from £36,125 to £40,522 over the past three years. Picket lines formed outside colleges throughout Scotland and dozens of lecturers gathered outside the Scottish Parliament to protest. Urging Colleges Scotland to “return to meaningful negotiations, in the hope of agreeing a resolution to this dispute”, EIS general secretary Larry Flanagan said: “Lecturers have been forced into this strike action by an intransigent management group that has refused to even attempt to reach a negotiated solution ahead of today’s strike.